Gomoku is an ancient game for two players, often referred to as an advanced version of Tic-Tac-Toe. The object is to get five pieces in a row on a game board of (potentially) unlimited size. Players alternate turns. Gomoku has been popular in the Orient for centuries. Pente is a commercial version of Gomoku, and combines the simplicity of Go-Moku, the flashy tactics of Niniku-Rinju, and the profound strategy of Go. Pente is a fast moving game of skill for two players. An online Java-based version of the traditional Japanese game of Go-Moku. Play Pente with friends anywhere in the world. 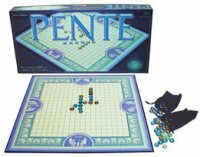 Pente Net provides the board, stones, rules, and game system for you. Pente.net was built to make it easy and fun for you to play Pente against your friends, no matter where they are in the world. Pente.org is a place to play Pente for free. You can play and chat live with other players, or play against a powerful computer opponent, learn strategy, play in tournaments and more. Renju is the professional variant of Go-Moku and uses more sophisticated rules. In renju the black player (the beginner of a game) is not allowed to make double-threes, double-fours or more than five in a row. Renju also uses sophisticated opening rules. Read more about the history and the rules of renju and other five-in-a-row games on this site.